We are delighted to be welcoming Sarah to our 50th anniversary ball – her Canvas story stretches over the years and it’s so lovely to hear that her young family have just enjoyed their first Canvas adventure together. Car unpacked we take in our surroundings and make ourselves cosy by the light of our gas lamp. The following morning we look out across the mountains from the terrace as we eat baguettes and croissants from the tiny campsite shop (having been ‘encouraged’ to ask for them ourselves) and drink chocolate milk (no fresh milk back then, refusal from all three girls to drink UHT!). It’s all so unfamiliar but so exciting. One of the best ways to explore the stunning Loire region of France is by bike. The beautiful countryside goes on for miles and as the majority of it is flat meaning it’s perfect for all types of cyclist, even younger children. The Loire à Vélo is a cycle network covering 500 miles from the Atlantic coast of France to just outside Nevers in Burgundy. Now, we’re not suggesting tackling this all at once but why not try a section. The great thing about the Loire à Vélo is that it is wonderfully flat – you could cycle for days without coming across an incline. Known as the garden of France, the Loire Valley in the centre of France is a lush green land with rich vineyards, charming towns and magnificent châteaux. There are over 300 chateaux in the region- far too many to visit in one holiday. Choose a few, take your time and really enjoy them. Some of the best include Château de Villandry with its superb Renaissance gardens, romantic Château de Chenonceau and Château de Chambord, the largest and most extravagant of them all. Once you’ve had your fix of châteaux there’s plenty more to see and do in the Loire Valley. 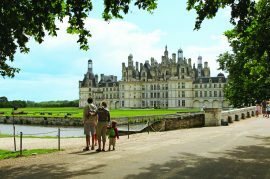 Explore the lively cities of Tours and Orleans, and the delightful towns of Saumur, Amboise and Blois. The mild climate is perfect for outdoor activities too. Walk or cycle through beautiful gardens or take to the water for a leisurely jaunt down the river. And of course, no visit to the Loire would be complete without sampling the excellent local wines. One of the first things that springs to mind when thinking of spending time in Italy is the delicious food that the country is famous for…pizza, pasta, cannoli…the list goes on. A favourite Italian dessert has to be tiramisu. The flavours all combined together are simply scrumptious! Tiramisu translates from Italian as ‘pick me up’ and this traditional dessert certainly does that. The lovely flavours of coffee, amaretto, chocolate and cream combine to make the most delicious and indulgent treat. 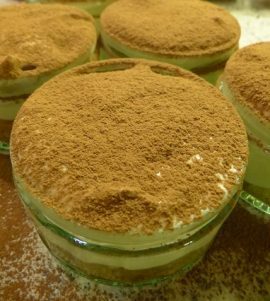 We had a go at creating this amazing dessert from Gino d’Acampo’s quick tiramisu recipe.